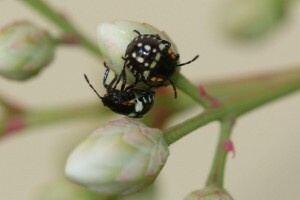 Home > Blog > Gardening > Bugs & Pests > Is it a Stinker or a Lady? Is it a Stinker or a Lady? Today I found the most amazing thing … hundreds of these tiny beetle-like bugs just emerging from cocoons and waking up on one of the Nandina domestica shrubs. 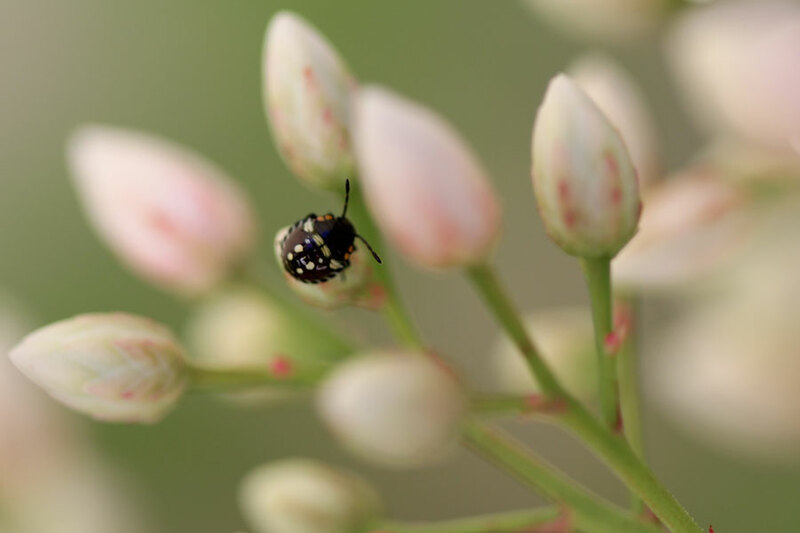 I was ambling around the garden late this afternoon after a hard days garden “clean up” and looking for blooms to capture for Bloom Day coming up next week, when my eye spotted these baby beetles through the camera. 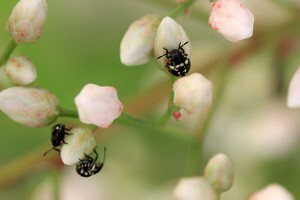 Although they are visible to the naked eye (they are about 2mm round at the time I saw them), I only spotted them as I was focussing in on the white blossoms on the Nandina as the beetles are still very tiny. I watched one emerge from its cocoon and I took hundreds of photos of it – regrettably not one of them is publishable, so I didn’t manage to get it on film. I’ve been to Bugguide.net and Whatsthatbug.com and I can’t make out what these are, but I am guessing they are either stink bug nymphs or lady beetles (hopeful!). I googled Stink Bug cocoon and stink bug chrysalis and it seems like Stink Bugs come from eggs, very green eggs. So I’m really not sure what these are. You can click on the photos to see the large versions. Can anyone help me identify these cute beetles? In other news … I found this visitor on the Lynchnis today. This is a stink bug I think. Pretty sure actually. I get lots of these. Oh dear – the first bug is a nasty!! I did some research and this is an African Painted Bug – Bagrada hilaris. They devour the host plant. Argh! They also devistate crops like maize, sorgum and the brassicas – kale, broccoli, cabbage & cauliflower. So I hope they are not going to destroy your beautiful Nandina. Hi Chris – I have seen those colours before in a bug (the first one). It isn’t a ladybug – they have these nymphs that look nothing like ladybugs, but more like aligators!! I’ll have to send you a photo one day. I’m going to go through my photo library and see if I still have the photo of one. The second one looks like a stink bug, but I’m not sure. Just hope they are good guys! The first one looks like a stink bug nymph to me. 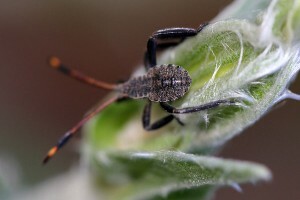 The second looks like a leaf-footed bug nymph. Difficult to get an exact ID from nymphs. 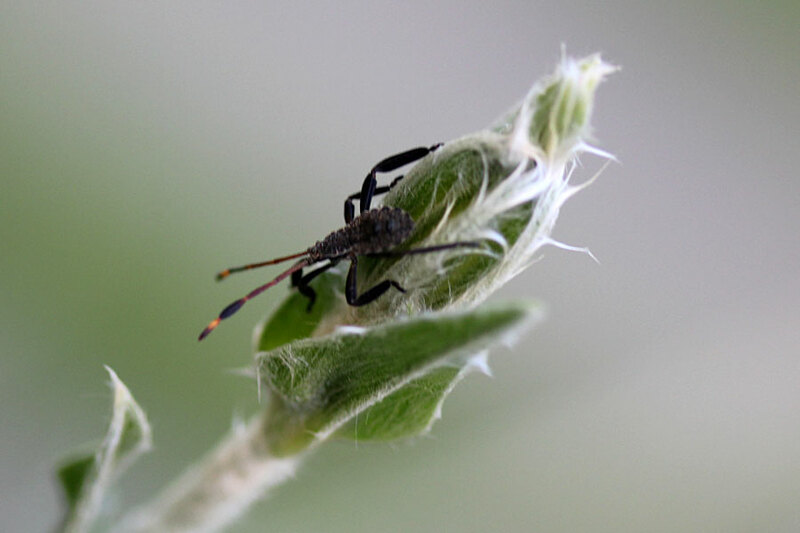 Egg color depends on species, and there are probably a lot of different species of both of these types of insects in your area. Glad to see you taking more insect photos! The site is down as I write, but it looked promising last time. This is South African and you can ask for help IDing our creatures. Yeah, the second group looks like stink bugs to me, too. 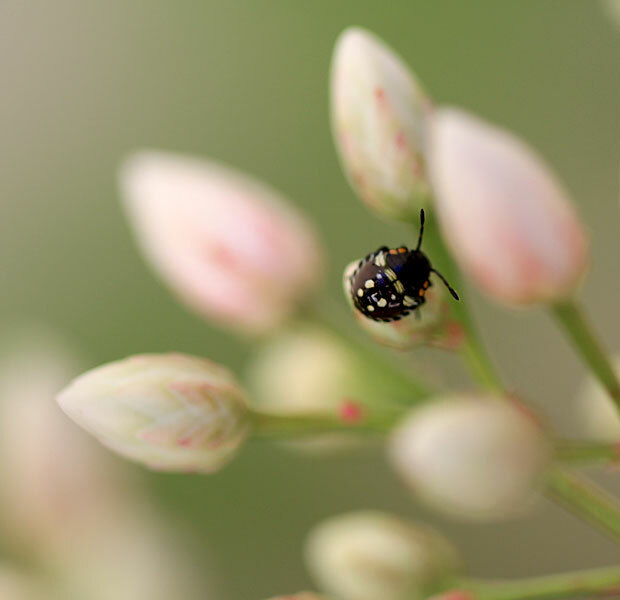 The first ones are like lady bugs or Asian lady beetles. But the markings are so different. I’ve never seen those before! Good luck with the ID. I hope they are beneficial insects! You really get some unusual critters. Sorry, I can not help you out. WoW! You have a nursery there! The second type reminds me of stink bugs, but first one… I am not sure. whatever they are, they are cute! !